Dr. Herget understands that choosing a dentist is a big decision. We want you to have an opportunity to visit our dental office, get to know Dr. Herget and his professional dental care team, and experience for yourself why so many satisfied patients keep coming back ! * This Offer Expires February 10 2017. The definition of a “NEW PATIENT” is anyone who has never seen Dr. Herget, or any previous patient, who has not seen Dr. Herget for 5 or more years. This deal cannot be combined with any other offers such as cash discount programs. Offer is subject to change or expire at the discretion of Dr. Herget. The cleaning procedure cannot be refused or this offer is void and invalid. In order to qualify for this promotion, patient must mention they were made aware of the promotion by accessing our website ( cheerfulsmiles.com ) at the time they make their appointment. This website is for informational purposes only and is not a substitute for Dental or Medical advice, diagnosis, or treatment. The information on this website does not create a patient-dentist relationship, and should not be used as a substitute for professional diagnosis and treatment. By visiting this site you agree to all its terms and conditions, which may from time to time be changed or supplemented by Dr. James J. Herget listed in the Disclaimer. If you do not agree to these terms and conditions, you should not enter this site. Dr. James J. Herget is a proud member of the American Dental Association, Wisconsin Dental Association, and the Dodge/Columbia/Marquette Counties Dental Association. Dr. Herget attended Marquette University in Milwaukee Wisconsin. He graduated in 1988 and immediately moved to Mayville where he has been practicing Family Dentistry for 25+ years. Dr. James J. Herget performs many dental services, such as : Dental Fillings, Dental Crowns, Dental Bridges, Dental Implant Reconstruction, Dental Cleanings and Dental sealants ( performed by a licensed Dental Hygienist ), metal free, flexible, partial dentures ( no full dentures ), root canal treatment ( incisors and bicuspids ), basic extractions, and only uses “low-radiation” digital x-rays. 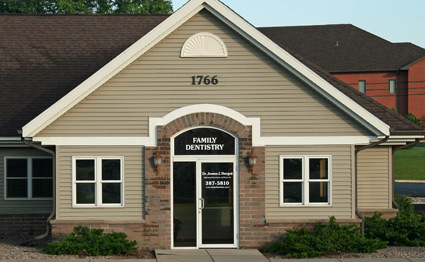 If you are looking for quality, family, reasonably priced dentistry : Dr. James J. Herget is your dentist of choice ! If you are a Facebook user we would love to have you as a Friend or just LIKE our page. Special Offers.